Singapore - Alpha Beta Omega today released Marina Bay Billionaire Clicker 1.1, its first mobile game title for iOS. 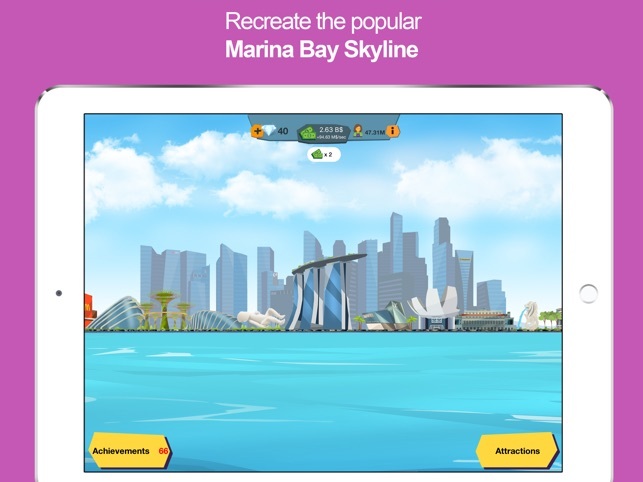 This clicker game allows players to rebuild the entire Marina Bay skyline, by attracting millions of tourists through the use of influencer pictures; created by tapping furiously on the screen. "We created this simple game as a tribute to the late Minister Mentor and founding father, Lee Kuan Yew. Our game challenges players to rebuild Marina Bay to what it is today, as he once described it - "a beautiful skyline, absolutely world class". That's why we made this game," says Michael Khoo, CEO of Alpha Beta Omega. 23rd March marks the fourth year of Lee Kuan Yew's death anniversary. His efforts have allowed Singapore to evolve from a 3rd world country into a modern megapolis " the pearl of South East Asia. In the last year, the island city was visited by 18.5 million people. The famous Singapore skyline along Marina Bay is regularly printed on post cards, a signature look of the region. Re-enacting the efforts of the founding father and first prime minister is now possible in a colourful mobile game published recently. Marina Bay Billionaire Clicker features iconic buildings like the Gardens by the Bay, Marina Bay Sands, and even a McDonald's. The game was created In memory of Lee Kuan Yew by game development studio, Alpha Beta Omega, from Singapore. Players discover local buildings that are unique to Singapore and add them onto an empty bay, eventually rebuilding the entire skyline that everyone is familiar with. To create buildings, attract visitors by producing "influencer" pictures in order to create income. Test quick reflexes by catching fly-by drones and ships that go pass. These drop crates that either provide bonuses or a surprise penalty. Build the largest amount of tourists and beat the record of 18.5 million tourists.